The company Irmaos Carvalho Coleccionismo, is a young company devoted entirely to collecting, the main support Numismatics and notaphily. Since founding the company, we are located in the middle of the heart of Oporto city (Portugal), a mere 50 meters from the town hall of the Oporto, at Ramalho Ortigão street n.º 40. Over the years we gained our space collecting the National and International, we pride ourselves on having custumers all over the planet, and this is one of the biggest reasons for pride and confidence by giving us more strength to continue to do more and better, Our goal is always to please the customer. Visit us at our store in Portugal, on ebay or in our webstor. Portugal - Diogo Cao - 1987 100 Escudos - Portuguese Discoveries - Silver Coin ! Portugal - XXVI Olympic Games - 1996 Atlanta - 1996 200 Escudos Silver Coin! Portugal - Gil Eanes - 1987 100 Escudos - Portuguese Discoveries Silver Coin ! Portugal - Bartolomeu Dias - 1988 100 Escudos - Portuguese Discoveries - Silver! Portugal - Nuno Tristao 1987 100 Escudos -Portuguese Discoveries Silver Coin ! 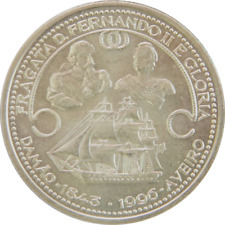 Portugal - Tanagashima - 1993 200 Escudos - Portuguese Discoveries - Silver !